"Phew that was hard work, open that gin bottle and pour me a friendly darling" is what I said to the other half as I kicked off my trainers and sank into the sofa after yet another successful event. Boy was I shattered, physically and mentally. My head was spinning from the fire fighting, social media posting, handling certain traders with kit gloves as their whole world collapsed over someone encroaching 4 inches into their trade space, singers not turning up, stepping in when Chefs fumbled over their words, not to mention someone forgetting they had a refrigerator cooler on top of their van and getting stuck under the railway bridge! That's just a few issues I had overcome that day. Why? After a year or two of working like a maniac on one large event, I'd recognised that stopping and starting the planning, led to continual stress and frustration and little improvement in targets archived. I wanted to grow the event but for my own health I decided I needed to re-organise my life, to take more care of my own needs. This 're-vamp's' aim was to achieve better results over a more relaxing twelve months Allowing for creativity, research and thinking. My life was for living and enjoying what I do best, not killing myself for other people through stress! What? Planning any large scale event takes a lot of time, a lot, organising several, and working alone in the most, is draining especially to orchestrate each to near perfection as visitors and traders now expect. There is the marketing, the sponsors, the traders, suppliers, artists and entertainers, venues, PR and Media, legal and insurance and so forth as the basics. So instead of all the planning being 'in my head', it was time to use a more structured system. I prioritised and date ordered when certain tasks were to be achieved by, based on my previous experience. This took some getting used to as a more mature event organsier stuck in her ways, but it worked. When? I started the new process,­immediately after the second successful years event. I realised that whilst I was organising one event, w I could actually now organise two at a time, now I had the experience and knowledge, one for this year and the skeleton outline for the year after. 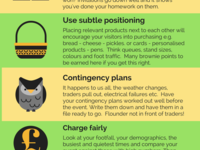 This is how multiple event organisers become successful. They have a set plan based on modifying a skeleton plan from their first few events, until they have a near perfect, generic working plan they apply to all their others. They change the dates, venues, layout and marketing etc. to suit each one. How? I decided to not only book the event date with the venue for the forthcoming year, but also for the year after. This meant I could ensure the venue was available, and the marketing could begin far earlier in fact the fourth event could now be advertised at the third event. I then created a trader booking page on Event Owl which allowed that third years traders to become early bird trade stand bookers for my fourth event. So that when I approached traders, as they had used Event Owl to book with me during the previous years, they not only could book, but I gave them a discount for their early booking AND allowed them to put just a deposit down. Thus my cash flow became rosier sooner and this catapulted my services as an event organiser. Further, I got better supplier buy in and better prices, and sponsorship was far easier. Who? It is essential to realise that the more successful the event, the larger the event tends to become, if not just to accommodate all those visitors! However, the more successful you become, the more you become responsible you are for everything that goes wrong! And it does! Attracting the right team around you is essential to your success, as either a bespoke, once a year event or a multiple event organiser.­ Certain res­pon­sibi­liti­es can be handled remotely such as legal and finance, the health and safety angle should be top of the list as you grow your event, as getting this wrong can stop the entire event dead in its tracks. As my events swelled in number, I attracted individuals to assist me with traders, health and safety (and food hygiene), waste control, stewarding, logistical set up, car parking and so forth. However there is a trick to finding the right people who will stay the distance and grow with you. I eventually handed over the events management side of my business to concentrate on Event Owl, delivering a bespoke trader to organiser online booking service, and providing event consultancy for start up organisers and those wishing to grow their event­/s. If you'd like more information on this service, please contact me on j.­whalley@­eventowl.­co.­uk or 0330 332 6224 for an initial free consultation.